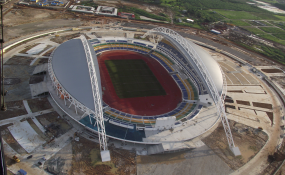 An aerial shot of the Sino-Gabonese friendship stadium, Libreville. Bechtel project managed the build of two stadiums as well as training facilities, hotels and roads in preparation for the African Cup of Nations, which took place in February 2012. When did Bechtel begin working in Gabon? The Gabon story started about 20 years ago. We put a master plan together for the government of Gabon, which they asked us to do, and they put it on a shelf. The time was clearly not right for it to be implemented. They called us about three years ago and said, 'You know that plan that you put together, could you actually help us implement it now?' And we started putting together a team of several hundred people, about half of whom are Gabonese nationals. The country has a clear plan for what it wants to do. So many countries in Africa, Gabon included, simply can't do everything they want to do. I think it does several things. One, just having a plan by a company like ours that can then implement it - we're not consultants, we actually follow through and do the implementation as well - but we're trying to do it in a way that is sustainable in the long term. We're actually interested in the big projects that Gabon may want to do in five or 10 years time. So what we really want is a government that has the capacity and the experience to implement projects. We're helping build that capacity so it's sustainable in the long term. Regarding sustainability, how about maintenance? How do you assure that in 10 to 20 years you don't have to go back into a country and work on the same infrastructure all over again? I think the first thing is delivering quality infrastructure. You don't have to travel around Africa too much to realize that people do have grand aspirations. People buy vehicles, products and services because they're reliable. We're trying to position ourselves where we are seen to be incredibly reliable in how we deliver things. So when we deliver projects we help manage delivery and make sure the quality is at a level where the product is actually going to last many years. We built a road in Croatia a number of years ago and there were zero defects in the first two years, which is almost unheard of for a motorway. So delivery of product that is of a high quality will certainly help if the government or the customer concerned perhaps doesn't have the mechanisms in place. And it's about building capacity and trying to show governments that if you do a little bit of maintenance every week you then don't have a big job to do. It also plays into building capacity, employment and all of those kinds of important things that politicians will look for in those environments. I think that it's encouraging. Certainly, that would be our value proposition - build a really good quality product and then help the customer go through a process of figuring out how they're going to look after it properly and how they're going to have that maintenance regime in place. Since Africa is starting at a substandard level when it comes to energy infrastructure, what has your focus been like on renewable energy? With respect to energy it's early days. We're beginning to look at renewable energy across the whole world and Africa is going to be an important part of it. But when you look at sub-Saharan Africa I believe it generates about the same amount of electricity as Spain, and Spain has a population of 45 million and sub-Saharan Africa is more like 800 million. The disparity is extraordinary so anything you can do to move Africa away from the really short-term diesel-fired generators to something that is more sustainable has got to be progress in a good direction. I think building reliability, building the transmission networks, all of those things are steps in a good direction. What we're trying to work out in Africa at the moment is what is the local capacity, what is local ambition and what is the gap between the two and where can we best add value? There is no point in us going to Kenya or South Africa to do power plants that local companies could do. What we're trying to do is help those governments and customers go and implement a step change. So we're looking for something that's transformative in those environments, like the Gabon program which is transformative in a different way. I think the government, because it has a clear plan and because they're now becoming a reliable customer for so many companies - Bechtel and other American and European companies - it suddenly starts to draw others into it. We look for reliable partners, a good supply chain, people who are like-minded. And the more people we see in an environment the more transparent it becomes, the more transformative it becomes, the more encouraging it becomes, the easier it becomes to convince financial institutions to put money into those places. Many of these countries don't even have a credit rating, for example, so to lend money into those environments is difficult for institutions. Seeing companies that are able to deliver projects, like ourselves, I think encourages people and I think it helps the transformation. How about Gabon's neighbor, the Democratic Republic of Congo (DRC), are you doing any work there? At the moment we're not working in DRC. Over the years we've looked at DRC. That's often regarded as the grand prize in Africa in terms of its incredible natural resources and incredible potential. But for a variety of reasons it's been a difficult place to work. Even projects such as the Grand Inga, which is a very big hydro scheme on the Congo River that's been around for several generations, hasn't happened for several reasons. It's remote, it's difficult, technically it's just extremely challenging to build something like that with all the water hyacinth that goes down the river, for example, never mind the complications of the downstream agreements that are required to raise the funding and all of those sorts of mechanisms. I think that lots of people have got their eyes on the DRC but it's a tough place to do business. I think that they may well be looking at that dam. China has been active in a lot of hydro projects in Africa. We've tended to look at some other dams in other parts of Africa, ones where maybe there's a private sector client who wants to deliver power to a range of mining customers, for example. We tend to concentrate on getting something to work properly and reliably rather than chasing the grand prize. This is about making sure that delivery actually happens on the ground so that you get a model that works and then replicating it in other countries. What measures do you think might support greater alignment between U.S. policymakers and the private sector, with a particular emphasis on power and infrastructure? What we're trying to encourage is a network of honest discussion about what is meaningful, how we can work together, how we can support each other in those kinds of environments. Seeing reliable institutions of the U.S. government in those environments encourages us. We talked to the Overseas Private Investment Corporation (OPIC). It used to be that OPIC took a long time to make decisions. Now they've given us a commitment that in principle when we bring something that's real to them they'll give an answer in hours rather than weeks or days. That's very meaningful for us and strongly encourages us to find the right kinds of projects that we can then take to them. OPIC works with the Export-Import Bank and they've got different kinds of instruments that are available. When you package those things together it helps make projects a reality. And I think that helps delivery of projects in those countries, and it helps benefit the supply chain that will ultimately help benefit the country that receives them as well as our home environments like the United States. What do you hope to see out of President Obama's trip to Africa? A number of things: I would hope that we would see a much greater dialogue between U.S. companies and U.S. instruments of state like OPIC and some of the financial institutions about how we can actually work together in environments like Africa. I would hope to see African governments realizing that there are a lot of people interested in their continent and there are a lot of people who can help them achieve their dreams, including companies like Bechtel. And so I would hope to see a more open environment and one that gets on and can begin to identify some real projects that we could participate in. Bechtel has said there are a number of measures that might be undertaken to improve the effective implementation of the infrastructure plans of African governments. Most important is a greater emphasis on identifying workable financing models for such plans. Can you elaborate? Having a customer in any environment that is reliable and sets a clear direction, sets in place appropriate mechanisms to finance projects makes things a reality. Governments, in particular ones that have new natural resources, like Mozambique, are probably getting overwhelmed with all kinds of offers. As a result it's quite hard to see how they're going to progress things. They've got a railway network that could be rehabilitated, they are giving out concessions to a number of companies, and not all of them are going to work. I think the government needs to say, 'This is what we want you to do and this is the finance that we need for it,' and set the rules and set the parameters quite clearly. Financial institutions respond to that. If you go before a credit committee they want to know that borrower has been reliable. People that need to borrow money don't have that kind of track record so anything governments can do to give confidence, be reliable partners, set a clear framework, those kinds of things are picked up on easily. There is money around the world. What it's looking for is a reliable place for it to go. What kind of things can African governments do better to help improve the business environment, and what are some of the biggest obstacles currently? There are many things. When we're talking about some of the kinds of projects that we'd like to do they're often not routine. So governments - and I include governments in the West, the United States and Britain - they don't often go through this. It's often not a well-practiced machine. When talking about relatively small countries, identifying a minister who wants to get something done, somebody who clearly is ethical, reliable and straightforward and then finding a small team to work with that minister can work wonders in a relatively small environment. For example, in some west African countries you quickly see the whole country is run by a handful of people. So if you can actually find somebody who has the power to implement something, we're simply providing the tool for them to achieve their dreams. When talking about some of the much larger countries you tend to want to then think about institutional development, think about things in the much longer term and that takes a lot more effort. Many of them have well-established practices. Take South Africa. It's a well-functioning economy - very substantial. What governments can do is be a reliable partner. Where they enter into commitments with companies like ours, delivering upon those commitments is incredibly important. That's true wherever you go in the world. That reliability spreads by word of mouth across the whole world and attracts more people. Gabon is a very reliable partner. They have delivered in terms of all of their commitments to us and we've been saying it consistently for a long time. That starts to attract the attention of lots of other people because we're saying it, and then when other companies like ours start saying it then it builds real credibility. I would encourage governments to make up their mind. What is it do they want to do? Prioritize projects and be a reliable partner and you'll find the door is open. People are fascinated by Africa and they feel as like they can make a meaningful impact.